FOLLOWING S.T. Joshi’s acclaimed three-volume critical edition of the Lovecraft fiction, this final supplementary collection includes all known revisions and collaborations undertaken by Lovecraft on behalf of his friends and clients. As with previous volumes in this series, the texts preserved herein scrupulously follow archival manuscripts, typescripts, or original publications, and constitute the definitive edition of these stories. Since Lovecraft’s customary procedure as a revisionist was to discard his client’s draft and entirely rewrite the story in his own words, much of the fiction in this collection represents original work by Lovecraft, including such notable contributions to the Cthulhu Mythos as “The Electric Executioner,” “Out of the Aeons,” and “The Diary of Alonzo Typer.” Supreme among the revisions in this volume is the brilliant nouvelle “The Mound,” which embodies Lovecraft’s satirical commentary on the Machine Age “decadence” of his era and which receives its first unabridged publication in the present edition. The Horror in the Museum and Other Revisions. By H.P. Lovecraft, With Texts Edited by S.T. Joshi, and an Introduction by August Derleth. 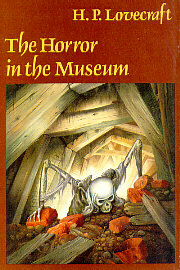 Sauk City, WI: Arkham House Publishers, Inc.; 1989; ISBN 0-87054-040-8; Hardcover.